Finally a few new ideas are beginning to arise and I am now wondering how to fund the next stage of the project. All Arts Council funding has been spent and, as with most things, the project cannot move forward without some money. It's interesting to contemplate the need for cash in a time of economic crisis. As a poet and author I have never known anything other than economic crisis and to a certain degree it has become my norm. Financial constraint is something that always has to be factored in to plots and plans and yet curiously I have always managed to find the money to enable me to do the things I have to do. I live a very rich poor life. Much like a pebble or a stone I suppose. And on that note I read an interesting article about the French artist Messager. At one point in her life she decided to name the tasks she undertook in order to define herself. I thought it might be fun to do this too. And so what am I? I am poet, author, stone carrier, dreamer, carer to my unwell mum, walker (walking is as much a daily need as breakfast for me). It's good to name the different occupations as I often think I should narrow my focus and concentrate upon just one thing. But that wouldn't be me - and what's the point of being someone other than myself? 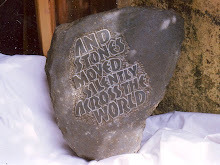 Let me know if you have any ideas about good funding sources for the next stone. I'm wanting to open the project up to a lot more people this time and need a good, strong wad of money behinid me!